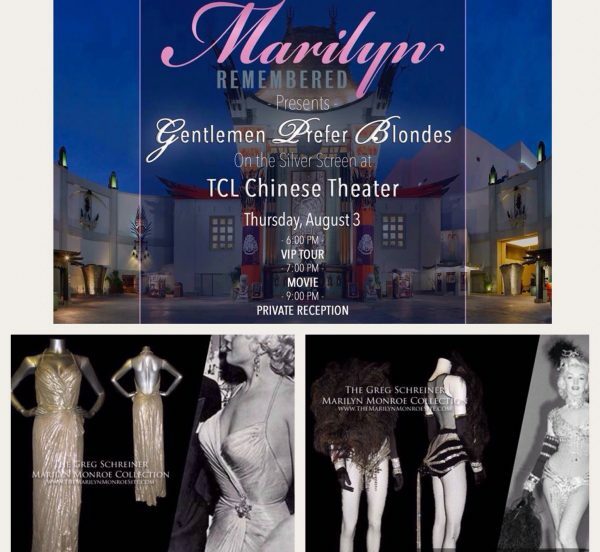 Gentlemen Prefer Blondes will be screened at the TCL Chinese Theater (formerly Grauman’s Chinese) on Thursday, August 3, as part of the memorial week activities organised by Los Angeles-based fanclub Marilyn Remembered to commemorate the 55th anniversary of her death. George Chakiris, who danced with Marilyn in the classic musical comedy, will be a special guest. Tickets are going fast, so if you’d like to attend, book here. Marilyn herself visited the Chinese Theater many times as a child, and famously signed her name in cement outside the venue alongside co-star Jane Russell shortly after the enormous success of Gentlemen Prefer Blondes in 1953. The original, rather risqué costume for her signature ‘Diamonds Are a Girl’s Best Friend’ number, and another Travilla gown (not seen in the movie, but subsequently worn by Marilyn at public events) will be displayed on the night, courtesy of collector and Marilyn Remembered founder Greg Schreiner. For more information on the Marilyn Remembered itinerary for this year’s memorial week, click here.